If you’re a fan of regular old bread pudding, you’ll die for this version, made with croissants. Flavor and richness-wise, it’s on a whole new level. Had nutritional information been attached to this recipe, I don’t think I would’ve let myself make it. Although the occasion was Mother’s Day brunch, so it was a splurge of a day. Of course, each guest was sent home with leftovers. 1. Leave 10 croissants out overnight to dry (or, on the day of, you can throw them in the oven for ten minutes to crisp them up). 2. Fill an 8” x 11.5” baking dish with chunky, torn pieces of croissant. 3. Slice bananas over top of croissants, wedging about half down deeper. 4. In a bowl, combine homo milk, cream, sugar, salt, almond extract, and egg yolks. 5. Pour wet mixture over top of croissants, making sure they’re completely saturated. Let sit for 15 min. 6. Top your bread pudding with slivered almonds and cinnamon, if you like. 7. Bake the pudding with your dish set in a pan of hot water at 350F for 45 min. or until golden. 8. Optional: serve with ice cream. The above shot was taken before baking the pudding. An after shot was out of the question considering how hungry we were and how good it smelled and looked. If you like this, I bet you’d also love my recipe for Banana Flambé with Goat Cheese Muffins. 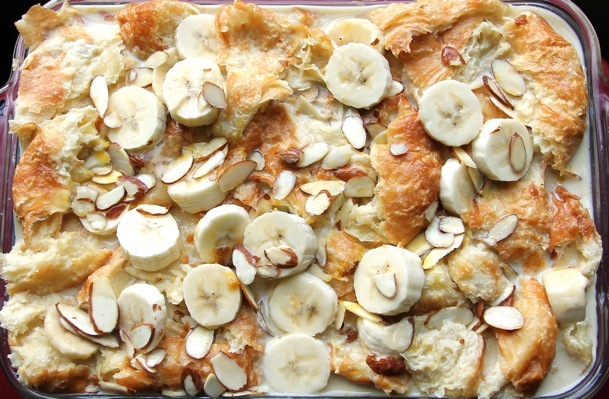 Thanks to @Finnsspace for her croissant bread pudding inspiration!